FULL OotP trailer : Read the script here! | SCRIBBULUS : HP gossip, dirt and news. The word is out that the full Order of the Phoenix trailer is being released in the next two weeks. More than that, we have what is supposedly the script for it. Click the ‘continue reading’ link below to read the full spoilerific trailer description! Working now to verify if this is real or not, we’ll get back to you shortly. Warning: It’s detailed. Thus most spoilery. Read at risk! UPDATE: Our spy who was at the Chicago screening of OoTP says this definitely sounds like the real deal. Shot of Harry walking through the station, the crowd parts and a man stands in pin stripe suite. Voiceover: Voldemort has gone into hiding, he’s biding his time, gathering his followers. Shot of bella opening her eyes looking crazed. Harry sat at the table in Grimauld place. Harry: Why will nobody believe me? Shot of a newspaper article landing on a table. Shot Umbridge at the podium in front of the school. 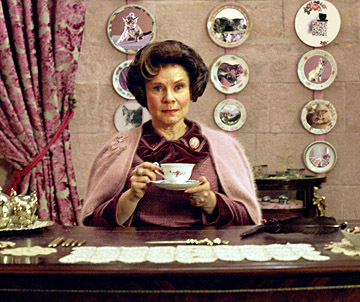 Hermione: (voiceover) Dolores Umbridge, Shes the Ministers secretary. Umbridge: i will be taking over as Defence against the dark arts teacher, Wands down, textbooks out. Umbridge: this is my school now Mr Potter, i make the rules here. Ron is blasted into a wall, Hermione smiles at him. Ron: is it that dream again? Shot of Umbridge looking up, she walks to the Doors of the great Hall. they Swing open. ~ by scribbulus on March 15, 2007. Wow! If it’s the real description of the trailer, we’re in for a great treat! I can’t wait to see it! It’s stupid that they give away what hapens to Sirius. Is it really real?! I want to believe it is!! But why havent WB said anything about it yet???? If its true-not long to see it!! Rumour has it, it’ll be out in 2 weeks. Someone who was at the pre-screening of the film told us it certainly does seem to have descriptions of actual clips from the film in it, by the looks of things. Nevertheless, I hope to see the trailer as soon as possible! Just to let you guys know, this person also was at the prescreening, so she could have made her own based on what she saw their. People at the screenings said there was no “blue room”, and this also has some lines from a fake trailer description that was going around earlier. Well, if it is accurate, we’l know in a couple of weeks, won’t we?! Sounds cool. I cannot wait to see the full trailer and of course, the full film! Now that we have the trailer… this describes some things that were actually in it. So can we assume that these are things that are happening in the movie? What does ME mean? It isnt stupid that they gave it away! On the trailer you cant even hear him scream SIRIUS! If you read the book you would know anyway!